BAY SHORE'S FRANK ROMEO REVEALS HIS "CLOSET ART"
"Closet artist" Frank Romeo teaches Bay Shore High School students about the effects of the Vietnam War. Aug. 2, 1969 was the worst day in Frank Romeo's life. In the Vietnam jungles, his platoon was ambushed, and 18-year old Romeo was shot seven times. After his body healed, he squelched this painful memory and assimilated back into his life, eventually setting in in Bay Shore with his wife and seven kids. But you cannot bury your past, and when Romeo turned 45, a subconscious urge compelled him to create art. Whenever he was alone, he would use new paints to pour out Vietnam memories onto his canvas. He would then squirrel these paintings into a closet, refusing to share the agonizing recollections with friends or family. When he finally relented, those close to Romeo encouraged him to let the paintings see the light of day at the West Islip Public Library in 1995. Through that event, he was surprised to learn that numerous Vietnam veterans, from Long Island to Australia, were also dabbling in what was known as "closet art"—work not originally intended to be shared with others. Artists like Randy Evans, Joseph Fornelli and Richard Yohnka have also helped bring the movement into public view over the last several years. It's a movement that, perhaps not coincidentally, began taking shape as the 25-year cycle of post-traumatic stress disorder surfaced worldwide in Vietnam veterans. From their unbounded silent sorrow, art with a unique beauty and understanding began to surface. For Romeo, Memorial Day understandably brings bittersweet memories. On Memorial Day 1997, however, Frank's oil painting titled "Why?" 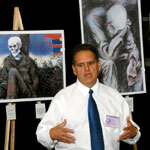 was inducted into Chicago's National Vietnam Veterans Art Museum. The piece applies its title question to hunger, war, violence and homelessness, and depicts some of the silent pain, passion and horror he witnessed in Vietnam. The plaque accompanying "Why?" reads, "Bonded For Eternity By Combat." The museum's contents were brought to the attention of Congress, who recognized them as a national treasure, something the artist saw as an ironic footnote. "I was amazed," he admits. "I knew the work was powerful and revealed a part of American history never seen before, but this was beyond my wildest dreams. After almost 30 years of dealing with post-trauma, I had gone from being spit on to being part of a national treasure." Romeo quickly became a local legend. After meeting and taking interest in many Australian closet artists in particular, he began hosting a traveling Australian Vietnam closet art exhibit called "Touched By Fire," which consisted of 500 oil paintings and a chronological mural showcasing Australia's involvement in the war. Still, Frank was chagrined to witness firsthand people's lack of knowledge about Vietnam. "It is startling that people do not know Australia participated in the Vietnam War for  years," remarks Romeo. "It was the longest-running war in Australia's history." After hearing countless people reiterate the same phrase—"I didn't know that"—he realized his artwork had led to his ultimate calling: Romeo recently participated in the Bay Shore School District's Ethnic Pen Student Writing Conference, and the New York State Council on the Arts and New York State Board of Education are piloting a program in which Romeo will work in conjunction with teachers, using artwork to educate students. Romeo is also aware that as we become further removed from the war itself, time is of the essence to keep its lessons alive. "The Vietnam veterans are getting older now," he says. "The time is ripe to share our past. Vietnam is a part of our history. It is like bringing someone back from the Civil War and being able to relive their experience firsthand with them." Doing his part to ensure the brutal legacy of Vietnam does not fade as its survivors dwindle in numbers, Romeo has also just completed an autobiography about his personal evolution and lifelong battle with post-traumatic stress disorder, which he expects to be published soon. "Today, the Vietnam veteran no longer stands in the shadows," he says assuredly. "He is the proud parent and grandparent with music recitals and soccer practices to take his children to. He is the man next door who has a business meeting and a school board meeting all in the same day. But that is only part of who he is. For through his eyes he has become a historian, a critic, a realist, a moralist and most importantly, a shaper of the future." call 1-877-675-6463 Long Island's new way to hook up. ©2004 The Morey Organization All rights reserved.